The All-in-One Fold & Roll System joins the ease and storage capabilities of the Fold & Roll system with the versatility and economy of creating numerous messages with one sign. 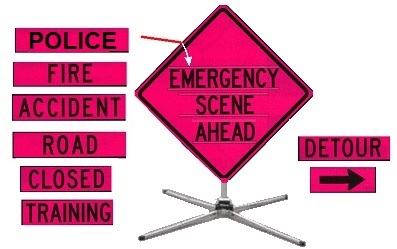 The kit includes a base message, EMERGENCY SCENE AHEAD, that can be changed with 8 overlay patches that attach with Velcro: POLICE, FIRE, ROAD, DETOUR, CLOSED, ACCIDENT, a Single Arrow and a blank panel. Optional: Choose custom words for up to 8 Overlays and enter in space provided. Heavy-duty storage bag with carry handles included for ease of handling and storage.